Not too long ago, a rainstorm was considered clean, pure and refreshing. But stormwater is often made toxic when it falls onto impermeable surfaces such as highways and rooftops rather than filtering through soil before it reaches streams, rivers and inland waterways. While stormwater runoff is a national concern, the problem is especially acute in Puget Sound, the second-largest estuary in North America, with 2,500 miles of shoreline and 19 major river basins that flow into its marine waters. Locally, polluted stormwater runoff kills salmon, endangers the orca population, impacts tribal and cultural activity, leads to flooding and threatens quality of life and recreation. Federal and state agencies have partnered with universities, local governments and others to research the issue and develop policies to seek solutions. Research conducted at Washington State University plays an integral role in that effort. A critical first step in developing policies and best practices is scientific research. 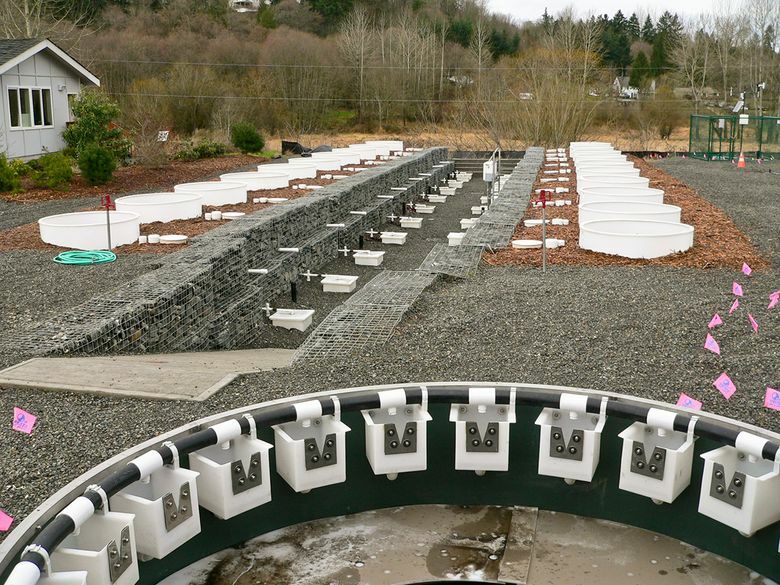 Scientists at the WSU Research and Extension Center in Puyallup recently spearheaded a project that demonstrated the alarming lethal impact of untreated runoff on coho salmon: Juvenile coho died off within hours of exposure to the runoff. The researchers found an old-fashioned solution to this modern-day problem — they detoxified another sample of runoff by channeling it through simple columns composed of dirt, sand, compost and other organic materials. Their findings: Coho salmon exposed to the filtered runoff were unharmed. The WSU Research and Extension Center is also the location of the Washington Stormwater Center. WSC was established in 2010 in partnership with the University of Washington Tacoma’s Center for Urban Waters, to protect Washington’s waters by addressing critical stormwater pollution issues. Dr. John Stark, an accomplished ecotoxicologist leads both the WSU Research and Extension Center and the WSC. The WSC serves as an information clearinghouse on low-impact development and emerging technologies. It hosts webinars and workshops on such topics as low-impact development for engineers and landscape architects. The WSC’s training program for low-impact development is now being used as a resource by state agencies and the state legislature to ensure that all pertinent audiences in the state receive the training needed to meet new stormwater regulations and codes. Much of the center’s work is designed to be ongoing. After publicizing information regarding stormwater treatment technologies, permit requirements, and best practices, the center reports more adherence to stormwater regulations and a greater willingness to implement low-impact development, resulting in improvements to water quality. By assisting vendors in developing effective, tested, and verified stormwater treatment technologies, competitively priced solutions are now available. Two Pacific Northwest foundations, The Bullitt Foundation and The Russell Family Foundation, as well the Boeing Company have joined to fund the director’s position at the Washington Stormwater Center, as well as the center’s long-range business-planning efforts. Boeing participated in the formative advisory committee for the center and has continued its support via partnerships as well as both monetary and in-kind investments. During the past three years, Boeing has contributed to the business resource program to provide stormwater management training, technical assistance and education to business and industrial stormwater permit managers. Boeing views the Washington Stormwater Center as critical for protecting water resources for our state and the Northwest region, and we need to ensure its future is sustainable. The Russell Family Foundation, also a funder from the beginning, has supported research that has documented the positive effects of low-impact development on reducing mortality among aquatic species. The Foundation believes the research at the Washington Stormwater Center shapes the future of how we live, work and play in this region.